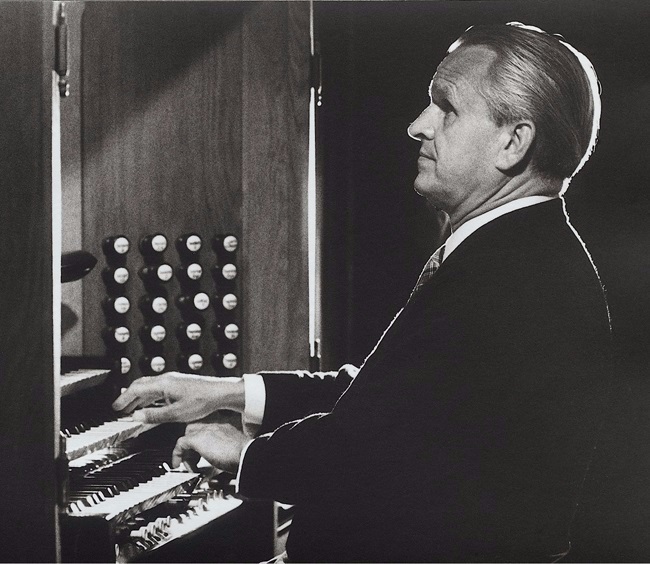 The great German organist, composer, and pedagogue Helmut Walcha (photo), who achieved fame by, among other things, writing a completion for and recording the final unfinished triple fugue on three subjects from J.S. Bach's The Art of Fugue, was vaccinated against smallpox when he was 19 years of age and, as a result of this vaccination, he became blind ... thus joining the ranks of many blind or mostly blind organists from history who learned how to overcome their blindness. Since he could not see to read music after that, whenever he would be learning a new polyphonic piece he would ask a student to divide it into fragments of 2 measures each and play the notes of each moving line for him, starting with the soprano. He would then use his ear to pick out the notes on the keys and play those notes himself until he had memorized them, than ask the student to play the next line down, which was the alto, and do the same thing. He would keep doing this with the tenor and finally the bass until all 4 moving lines had been memorized this way, singly. After learning this fragment voice by voice he would then practice all four moving lines together, maybe 4 or 5 times through for the first 2 measure fragment, until he memorized it. It's also possible that after he worked the voices singly he worked them in combinations beginning with 2 at a time, then 3 at a time, before he practiced all 4 of them together, but, the point is, he memorized this first fragment of 2 measures by learning it voice by voice, singly, then putting all the voices together. After that, he would proceed through the rest of the piece in the same way, in 2 measure fragments, learning them voice by voice until the entire work was learned this way. He found that, by learning his pieces this way, he could remember it for a very long time because it locked every moving part into his memory very well. This same method of practicing a work, if we try it for ourselves, has the benefit of teaching what each voice is doing at any point along the way and helping us to remember it really, really well. While this kind of practicing seems to be slow and moves along gradually, it actually saves time in the long run by making our practice meaningful and focused and deliberate each time. This method of learning the piece voice by voice and in combinations of 2 and 3 voices before putting all 4 together was not part of Dupre's method; Dupre advocated always practicing the parts of a fugue together, simultaneously, and always in 4 measure fragments [See blog, Practicing and Memorizing, Part I]. We might try this for ourselves, to experiment and see which way of practicing, Walcha's or Dupre's, helps us to learn it more deeply or is more satisfying and enjoyable. A moment's thought will show that the same mathematical formula which applies to calculating the number of stop combinations an organ has [See blog, Calculating Stop Combinations, Parts I-II] applies to figuring how many voice combinations a student has at their disposal for practicing a 3 or 4 voice fugue. In a fugue written in 4 voice texture (SATB) for example, it can be practiced a single voice at a time, or in combinations of 2 or 3 voices at a time, or all 4 together. This means there are 15 possible way to practice it: S, A, T, B, SA, ST, SB, AT, AB, TB, SAT, SAB, STB, ATB, and SATB. While it takes dedication and passion to follow the discipline needed to learn a new work this way, and to practice each of these 15 ways 3 times without mistake before moving on, it's time spent wisely, frugally, and productively. An organist is well-advised to approach the learning and practicing of polyphonic pieces in general, and fugues in particular, in a special way which is different than the way one would practice any other music [See blog, How To Learn A Fugue].